A very dark and creepy entry into the World of Oz, this movie has some cool ideas, but the overall story is nothing special. 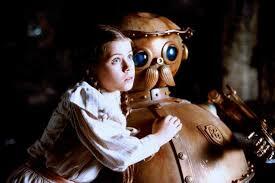 Return to Oz is a very strange movie. Not that the original film was in any way usual, but it was certainly the kind of film that could be considered light hearted fun. The sequel takes the world that was created in the original and spins it out into something extremely bleak and bizarre. If you thought the Empire Strikes Back was a dark sequel, just wait until you see this. Instead of musical numbers like in the first one, this time around we get a little girl being subjected to electro-shock therapy. Yeah, I’d say the stakes have changed. At the start of the film, Dorothy, (now, unexplainably, at least five years younger than she was in the original film,) is on the farm with her Uncle Henry and Aunt Em. She talks about the world of Oz that she has been to and all of its wonders. Her Aunt and Uncle don’t like this, and decide to have her institutionalized. Nice solution. It’s an overnight stay, and the doctor shows Dorothy a machine that looks like a face. Then she goes to her room and picks up a small pumpkin. These items will represent some of the friends she makes in Oz, much like the way that in the original film, her friends in Oz (The Scarecrow, Tin Man, and Lion,) were played by versions of the farm hands who worked for her Uncle in Kansas. Now, at the institution, it comes time for Dorothy to get her electro-shock therapy treatment. They strap her down to a bed and try to turn on the machine that she was introduced to earlier. Only the machine doesn’t work. There’s a huge storm outside and the whole place loses power. Dorothy escapes the room and hides around the building. She then runs outside and gets knocked down into a river. Dorothy lands on a floating piece of wood, and lies there, unconscious, as she is carried off. When Dorothy is awoken, she is in Oz. She wakes up to the sound of her chicken speaking. This is Henrietta, one of Dorothy’s pets from the farm. Much like how Todo accompanied Dorothy into Oz in the original film, the chicken has come with her this time around. The talking chicken and Dorothy now start to wander around and go to a statue garden. It seems nice and peaceful until they get a close look at some of the statues. There are some headless dancers all standing around in a circle, holding hands. And then there are statues of the Tin Man and Lion. Dorothy recognizes these as the actual Tin Man and Lion from the first film, who have been turned into statues made of stone. That’s when the Wheelers show up. The Wheelers are some pretty scary creatures. They are men who wear tons of eye-liner and makeup, and travel around on all fours. They have wheels attached to each of their limbs, and move by gliding around on the ground. These guys repeatedly chase after and attack Dorothy. She runs away from them and uses a key, which she found before she came to Oz, to unlock a secret door hidden in a wall. Once she gets behind the wall and into a sort of closet, Dorothy finds a robot named Tick Tock. He’s a short, stocky bronze machine, that comes to life when Dorothy winds him up. Tick Tock looks like a combination of Teddy Roosevelt and actor Wilford Brimley. He helps Dorothy escape the Wheelers and they even get information out of one of them. The information leads them to the castle of the Princess. Inside the castle, they not only find the Princess, but also her hall of heads. Each is the head of a woman and sits inside a glass case. The Princess switches heads at free will and even sleeps without any head on at all. When her headless body wakes up from a nap and goes walking around the castle, it’s very creepy. This might look funny and campy to adults, but it’s certainly not for kids. This stuff is way darker than anything that was ever in The Wizard of Oz. The Princess locks Dorothy inside an attic, where she meets Jack Pumpkinhead, a skinny guy with a giant Jack O Lantern that sits atop his neck. Together they tie up a couple of sofas, attach a moose head, use small branches and leaves for wings, and steal some animation powder. They use this powder to bring the moose sofa to life. Now we have the whole crew. There’s Dorothy traveling along with a bunch of companions who could all be seen as versions of her friends from the original movie. Henrietta is Todo. Jack Pumpkinhead is the Scarecrow. Tick Tock is the Tin Man. And the moose sofa is the lion. That’s the connection that really doesn’t work, whereas the other ones all pretty much do. Dorothy and her companions travel to see the Rock King in the mountains and this is where the movie really goes off the rails. Sure, it’s the end of the film, and it hardly kills the momentum that the movie had going before it, but the history with the Rock King is pretty fuzzy and so is everything that happens to him and why. 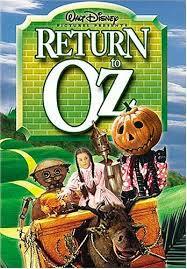 At one point Dorothy is treating the conflict as just a misunderstanding between the Rock King and the Scarecrow. At another point she acts like the Rock King is just as much at fault as the evil Princess. None of it is very interesting. The movie ends up being just okay. The dark tone does border on being a little too bleak, but overall the change of pace and style is appreciated. After all, the last thing we would want to see is just another version of the original. This movie finds its own path and approach. The story itself seems a little light on content with Dorothy really only visiting three locations in Oz. The statue garden, the castle, and the Rock Kings layer in the mountains. And then there’s the actual Scarecrow, Tin Man, and Lion, who all make cameo appearances and look entirely different than they did in the original film. Most notable is the lion who is now completely an animal, walking around on all fours, and unable to say a word. There are lots of questions and issues with this movie, but despite its flaws, it is still an renter raining experience. If nothing else, the thing to appreciate here is how dark it gets (the hall of heads,) in the interest of pushing its creativity.